MADRID — Leganes and Getafe drew 1-1 in a Spanish league derby between southern Madrid clubs on Friday. Getafe is sixth in the standings and has not lost an away match since a season-opening 2-0 defeat against Real Madrid. 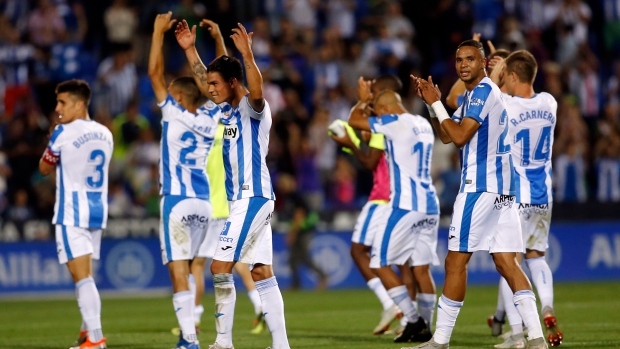 Leganes is in 16th spot and six points clear of the relegation zone ahead of this weekend matches. Leader Barcelona is at Espanyol in the Catalan derby on Saturday while second-place Sevilla — which is one point behind — visits Valencia. Also Saturday, third-place Atletico Madrid hosts fourth-place Alaves. Fifth-place Real Madrid visits last-place Huesca on Sunday.